Coach Mike Krzyzewski says osteoarthritis pain made him "different person"
Duke basketball coach Mike Krzyzewski, the winningest men's college basketball coach of all time, could have had his legendary career derailed by chronic pain caused by hip problems. Krzyzewski, known to many as Coach K, told CBSNews.com that his battles with chronic pain date back to 1994. That year, he underwent back surgery that caused him to miss most of Duke's season. But the pain would get worse in the ensuing years. "It really manifested in really bad pain in 1998, just before the start of our 1998-99 season," the 65-year-old Blue Devils coach said Wednesday. Krzyzewski felt severe groin pain, and after a trip to the doctor, learned that pain was actually caused by his hips. Coach K, who was 51 at the time, had osteoarthritis in his hip, one of the most common joint disorders that causes chronic pain and disability. The condition is caused by aging and wear and tear on a joint. Bones and joints are cushioned by cartilage, a firm rubbery tissue that allows bones to glide over one another. However when cartilage breaks down from aging, the bones rub together and cause pain, swelling and stiffness. About one in four people develop painful hip arthritis during their lifetime, according to estimates from the Centers for Disease Control and Prevention. Krzyzewski's doctor told him he'd need a hip replacement, but the coach instead had the reactions of many who are faced with the decision: He feared the thought of having a foreign object implanted in his body, and thought he was tough enough to work through the pain. With the start of the season nearing, he also thought he wouldn't have the time. Nonsurgical treatments for early stages of osteoarthritis of the hip include rest, physical therapy, and nonsteroidal anti-inflammatory medications like ibuprofen for pain, according to the American Academy of Orthopaedic Surgeons. Once the hip joint hurts when resting at night or once it becomes severely deteriorated, a doctor may recommend a total hip replacement. Not only did Krzyzewski develop a limp while losing his range of mobility that season, the constant fight through the pain took its toll on his personal life. "You become a little bit of a different person because you're always tired and you're always distracted by the pain," Krzyzewski said. The pain got so bad, he couldn't even get on the court with his players -- his livelihood -- and was confined to coach from a stool by season's end. "We ended up playing for the national championship that year. I had a great great team, great talent, but by the end of the year, I was dead," he said. "I didn't give my team what they needed I thought at the end." The Duke Blue Devils lost to the UConn Huskies in the NCAA Championship that season. He decided to get his left hip replaced in 1999 days after the game, and found the pain subsided and his movement returned. Three years later he got his right hip replaced, and says he's been pain-free ever since. He concedes it would have been smarter for him to get the surgery earlier, which is why he's teamed up with Depuy Orthopaedics, Inc., a maker of artificial hip replacements for which he is a paid spokesperson, and author Ellyn Spragins, who wrote the best-selling book "What I Know Now: Letters to My Younger Self." Their new campaign is called "Had I Known Then...,"and includes letters from people who underwent joint replacement surgeries. "In writing this latest collection of letters, I discovered that few people have reflected on the impact their health has on their lives, and yet our physicality is intimately tied to our emotional well-being," Spragins said of the campaign. "When we are in pain, this not only takes a toll on our ability to do our jobs and pursue activities we love -- it also erodes our happiness, relationships and, sometimes, our sense of who we are." Krzyzewski wrote himself a letter, questioning why he dealt with the pain for so long without seeking help. "You're not Superman, Mike, even though you were kind of taught to be," the legendary coach, who graduated from West Point, wrote himself. "Be smarter about this pain." 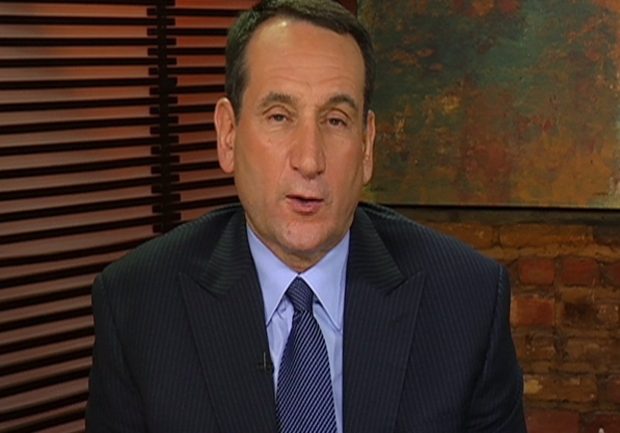 Today, Coach K says he's in great shape, pain-free and more active than he's been in years. He's won two national championships since getting the surgery -- bringing his total to four -- and on Nov. 15, 2011, passed Bob Knight for the all-time wins record in Division I men's basketball history, a total he keeps adding to. "I feel like they're mine," Krzyzewski said of the hip replacements. "I haven't had pain for 13 years and I move around better now at 65 then I did at 52." The Mayo Clinic has more information on osteoarthritis.